Sirocco has been completely reformulated in 2015. 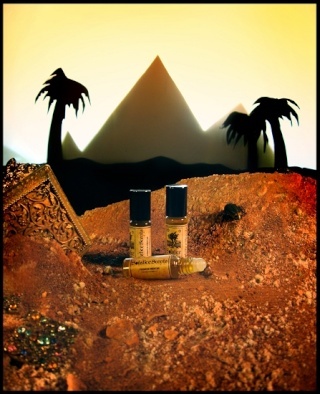 It is a blend of sandalwood, precious saffron threads, hot baked Earth, myrrh resin, spices and a touch of oud and jasmine which meld together to create a dry, woody, resinous and spicy scent representing the blisteringly hot desert, spice caravans and never ending sun scorched sand. The woods and spices on cold sniff and initial application quickly turn dry and resinous as the saffron and myrrh boldly emerge. A hot Mediterranean wind stirs desert sands, fusing with the incense wood notes. Sirocco combines sandalwood essential oil and fragrance with a baked Earth Indian attar, myrrh and saffron essential oils and a medley of spices with a faint trace of sweet jasmine absolute. Very subtle additions of aged patchouli, vetiver, cardamom, rose and labdanum essential oils and absolutes add supporting depth though the main notes to be detected are the aforementioned. The dry down is warm, sandy, woody and spicy. Sirocco does lean a bit masculine but it is a very unique fragrance that Women would love to journey with as well. I don't know what happened here. I was a huge fan of the original sirroco. It was my favorite scent in the catolog. It was rich, warm, dry and slightly sweet with creamy sandalwood. The reformulation is dirty, it reeks of damp over powering vetiver and is distinticly masculine. No, dry, sweet, creamy, precious wood notes at all. I hate it and can't wear it at all. So, dissapointing. The sandalwood in this scent really shines! It's warm, woody and spicy sweet. But the spiciness is smooth not sharp and the sweetness isn't overly powdery or cloying. It has an incense scent but isn't smokey. Even though this is a warm dry scent perfect for summer I will definitely be wearing it in the fall and winter to warm things up. It just melts into you, like a second skin, very comforting. I am quite fond of Sirrocco. Although the sandalwood is present, I don't think of Sirrocco as a typical sandalwood scent like Sirrocco's younger, sweeter cousin Cascade of Gold. When I first read the description words like "dry" and "hot" were used. I couldn't imagine what that would smell like, but now that I have, it does seem like a hot, dry earthy scent. Like the smell of a desert caravan. The floral note is not obvious, it's barely there, but I think it keeps this scent from being overly masculine or parching. This scent reminds me of a hot, dry end of summer day and it is very appropriate for Fall and Winter. This is a great scent to layer with a sweeter gourmand. I would call this a dry/hot/unisex saffron sandalwood blend. It is complex. Another melange of spicy scent like White Feather. This is absolutely lovely. It's exactly as the description would suggest. I get a feeling of a hot, dry, desert. There's a red clay/sand accord, with a breeze effect wafting light delicate spices and woods, in particular saffron. It's very unique, and I can tell the ingredients used are expensive and of good quality. I tried it for a few weeks then had to get a full bottle, I enjoyed it that much! I think it's unisex but lays more on the masculine end of the SS offerings. I actually don't think that this smells too different from the original Sirocco, and I love it in the edp form. It's still reminiscent of red clay baked in the sun and has intriguing doses of resin, dry spice, and sultry sandalwood. It's beautiful on my husband, but I like it more on myself. It smells outdoorsy, earthy and dark in the most unique way, with no greenery. It's smooth and gorgeous and the 'hot baked earth' and 'myrrh' are strong & fantastic. It's in the same vein as scents like Mancera's Sand Aoud and Tauer's L'Air Du Desert Marocain. Earthy resin with unique spiciness.